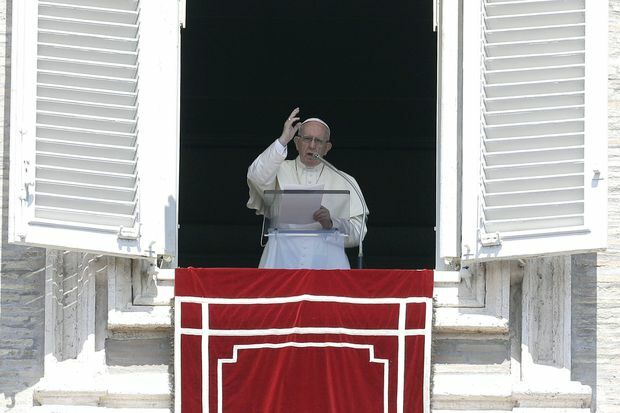 Pope Francis delivers a blessing during the Angelus noon prayer in St. Peter's Square, at the Vatican, Sunday, Aug. 19, 2018. Re The Pope’s Strong Words (editorial, Aug. 21): When the Pope removes bishops from office who have either molested children themselves or covered up for clergy who have, when he publishes their names and ends the silence that has shielded their perversity and the even greater perversity of the church in protecting them, then, and only then, will his strong words have meaning. Debra Soh, writing about the root causes of pedophilia, suggests that the preference is “hard-wired and not something that can be changed,” and that “fact-based discussions will help us protect children by identifying at-risk individuals before they offend” (Horror And Disgust Shouldn’t Be Our Only Response To Pedophilia – Aug. 20). Perhaps Ms. Soh could examine what was hard-wired in the immoral Roman Catholic priests, bishops, cardinals and popes who knew about the abuse, ignored the abuse, and enabled the abuse for years. These men sacrificed generations of children to protect the almighty church. Knowing what compels people in power to abandon all moral decency would also help us to protect children. Re Back To Basics In Ontario Education (Aug. 21): Margaret Wente ponders the value of math education in Ontario under the current curriculum. She is concerned that one third of teacher candidates were unable to pass a math test set at the Grade 6-7 level. Students in Ontario are required to meet a minimum standard for literacy up to the end of Grade 9 in order to graduate from high school, and must passs the EQAO-administered standardized literacy test in Grade 10. It gives us confidence that a student leaving Grade 12 is effectively able to communicate at a Grade 9 level. It’s time to add a numeracy component to the EQAO. A student shouldn’t be allowed to graduate high school until they can demonstrate the ability to master Grade 6 math – which shouldn’t be too onerous, since they must pass a Grade 11 math course to get a high school diploma. Three (that’s 2+1) cheers for Margaret Wente’s math column. When I realized, during the summer between Grades 3 and 4, that I hadn’t yet learned my multiplication tables, I asked my mother, a student of the old “rote and repetition” school, to teach me. It became a summer of dread: She would spring them on me at every opportunity. While it did nothing then to enhance our relationship, the tables became second nature, and I’ve been grateful to her for that crummy summer ever since. Re Trudeau Defends His Reaction To Heckler (Aug. 21): I, too, would like to know if the federal government is going to repay Quebec the $146-million the province says asylum seekers crossing the border have cost it. I’d also like to know if it is going to reimburse Toronto for the $64.5-million it is spending to provide shelter and housing to border-crossers. Does that make me a racist, too – or someone who thinks the Prime Minister should step up to the plate with more than virtue-signalling platitudes? It is Prime Minister Justin Trudeau’s policies that are setting a dangerous path for Canadians. He should actually listen to what ordinary Canadians are saying – instead of making eloquent speeches full of generalities and exaggerations, assuming Canadians accept his ideologies. If he showed empathy toward Canadians, apologies would not be needed. Re Liberals Took Steps To Block Omar Khadr From Celebration Near Parliament Hill (Aug. 21): Omar Khadr, visiting Ottawa with his wife, was spotted in the Senate visitors’ gallery. To me, it is reassuring to know that he finally has a life after an extended period living in such turmoil. The fact he was there means that he and his wife can make travel plans. What risks are perceived from Mr. Khadr today? Does he deserve to be on a list that would keep him out of the Parliament buildings, given the security checks that all visitors go through? What other long-term punishments would the Conservatives impose on him? He was given a settlement after the wrongs done to him by the Canadian government, much of it by the Harper-led Conservative regime. If the Conservatives can’t move on from the meanness of the Harper era, how else will they strangle Canadians in future? They lost the last election, in large part because of their meanness run amok. Re Why Misery Is Being Weaponized In War (Opinion, Aug. 18): This depressing and distressing article ends with the authors’ non-specific plea for “governments and ordinary citizens … to take action.” It puts me in mind of the psychoanalyst Christopher Bollas who, in a 2015 scientific paper, referred to this time in human history as the Age of Bewilderment. Re In Extreme Heat, Landlords Should Be Required To Keep Tenants Cool (Aug. 20): Heating is a necessity for Canadians’ health, but according to StatsCan, only 55 per cent of Canadian households have central air conditioning or window-mounted AC units, whereas 45 per cent do not have AC (Households and the Environment Survey, 2013, released March 10, 2015). This summer, regrettably, a few people with serious medical and mental conditions died because of excess heat. To avoid those deaths, people who are sensitive to heat need access to AC or cool spaces, and that is something health agencies can and should address. It would be ludicrous to force all tenants to pay for AC, or to force their landlords to provide and pay for AC. Is the nanny state to force all homeowners to use air conditioning, too? Re Memories Of Iberia (In The Kitchen, Aug. 18) I love the thought of gazpacho. Summertime, fresh vegetables and herbs! Everything that should result in a delicious soup. However, I have always been disappointed with the bland dish that results. Last weekend, after reading Tara O’Brady’s article and ingredient list, I decided to give gazpacho one more try. The basic soup was very good, but the “salad” on top added zing! For my husband, the pièce de résistance was the sardine tartine. This recipe is definitely a keeper. Keep them coming and thank you.